My quest to get an FM Towns set up continues. I’ve certainly learnt a bit but still had no success with my first attempts with an external hard drive so am going to try a SCSI2SD device next. More on that when it arrives and if I actually get it working. This is a Sharp Cyberstick controller and is about the only option for an analog joystick on the FM Towns as far as I’m aware. 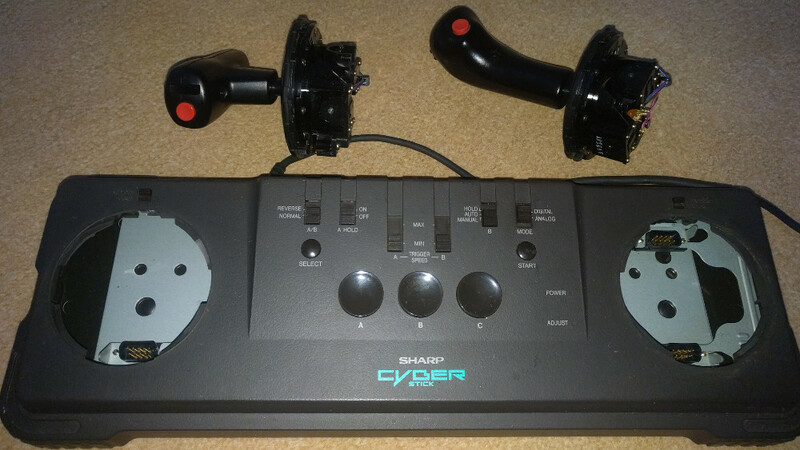 There are some more conventional analog gamepad controllers but it has to be a joystick for Wing Commander. The Cyberstick is also supported on the X68000 (should I ever happen to get one) and apparently on a handful of Mega Drive / Mega CD titles. Those Mega Drive titles don’t include Wing Commander I’m sorry to say. It’s a fairly high end device with a good deal of customization options available. The most striking of these is the ability to remove the stick and throttle and swap their positions around. A little side benefit of this is that all the working parts of the analog controller can be easily exposed and serviced should it be required. The unit is quite large but not as large as I might expect. Comparing it here to the Sony dual analog controller, there is a marked contrast in size and I would prefer the joystick especially to have been considerably bigger. I suppose this was aimed squarely at the Japanese market who presumably have slightly smaller hands on average. As for myself, I’m left holding on with my fingertips. The resistance on the stick is extremely low so it’s still very controllable like this. The throttle on the left isn’t a true throttle as it returns to the center position when released. When using it in Wing Commander, it essentially acts as a switch to raise and lower speed. A true throttle would have been far more satisfying but limited the controller in other games no doubt. A switch to turn the centering off/on could have cured this but no such luck. I’ve not played a lot of Wing Commander with the Cyberstick as of yet as I’m waiting until I get a hard drive. My main complaint would be that the controls don’t appear to be re-definable and while there are nice touches like being able to use the little toggle switch on the throttle to lock/cycle targets, the D button on the throttle only duplicates the B button on the joystick to fire missiles. This means that to use the afterburner, I have to let go of the throttle entirely to reach over for the C button in the middle. It works but surely didn’t need to be this clunky. Truth be told, I’m a little disappointed with this controller. It’s like Sharp set out to make a flight controller and then thought it had better work with other types of games and compromised. The main body of the unit is large and heavy yet the two sticks themselves where you will have your hands 99% of the time are lightweight and a bit cheap. It comes across as a bit of a toy when compared to the Thrustmaster’s and the like that were on the PC’s of that era. As such, I’d rate this behind the Sony dual analog and especially the 3DO CH flightstick when it comes to the options for playing Wing Commander games on consoles. 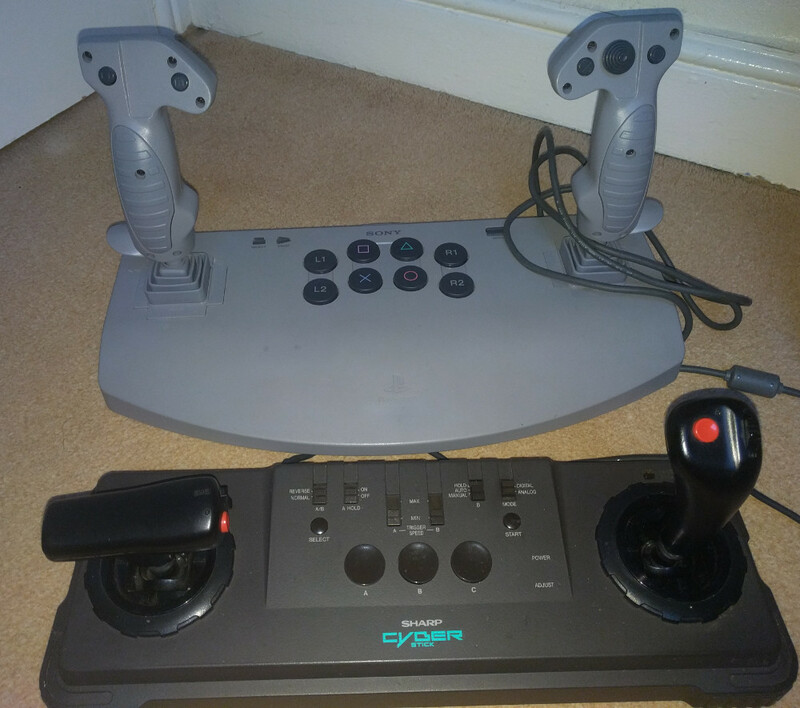 Neither of those systems had the original Wing Commander 1 & 2 though and this is definitely preferable to using a gamepad and/or keyboard. It’s an essential extra if you want to play Wing Commander on a real FM Towns but you’d better be more than a little fanatical about such things to make it worthwhile, or have really, really small hands.